Happy Thanksgiving everyone!! I did get to go fishing last week! Roaring River was WONDERFUL!!! Lots of fish and a few big boys! I forgot to price the Ninja for you. It's $230 plus shipping. It's a great rod!!!! You will nymphing with the pros!! Here's a pick of my baby girl taking a fish off my line! Thanks baby!! Wow!! It's been a long time sense I've posted. I'm going to try and do better. It's been a good year and I can't believe it's almost Christmas. 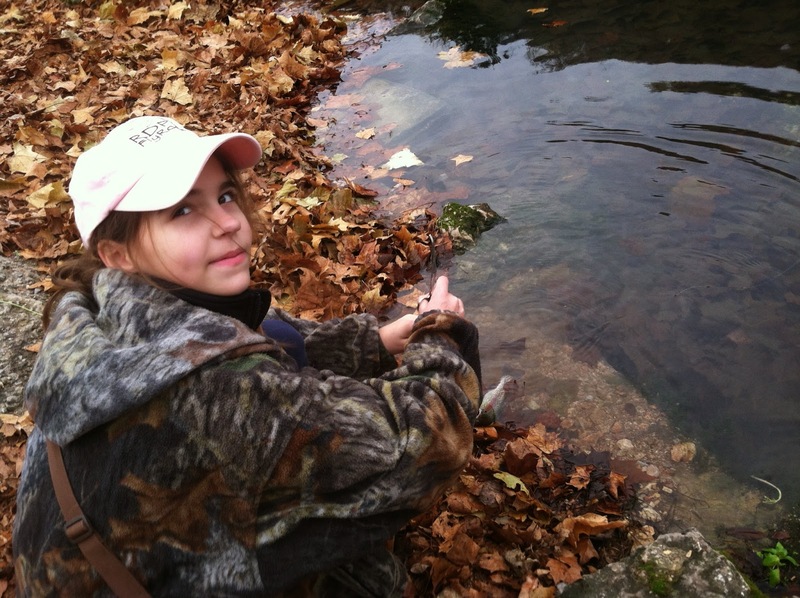 My youngest daughter and I fished all the state parks here in Missouri this year and it's been the best!! We called it the Grand Slam of fishing this year. I'm getting ready to start selling a great 10' 4 piece Nymphing rod. I call it the Ninja. Everything is BLACK on it. Over sized single foot eyes and a full cord grip. It's selling great in Canada. Very light for a 10' rod. Happy New Year everyone!!! It's been a GREAT year!!! 134 fly rods sold and I don't know how many blanks!!! I've sold all over the world but I've added many new places this year. Ukraine, Germany, Cez Republic, Chile and many more. I'm thrown back every time I see a new country!! It's a honer to build them for you!!! I've met so many great people that it overwhelms me. Thank you for your emails and pictures and kind words. Keep the pictures coming!! I Thank God for giving me this great hobby and all my new friends around the world!!!! Now for the year end. I've reviewed my costs for the components and blanks for my rods and there will be a price increase. For my existing customers I will honer my 2013 pricing for one year.(2014). My prices are still really good for a custom rod and they are really great rods to fish with also but I just can't build them and not make a profit. Thanks and I hope you understand. Thank you!!!! !